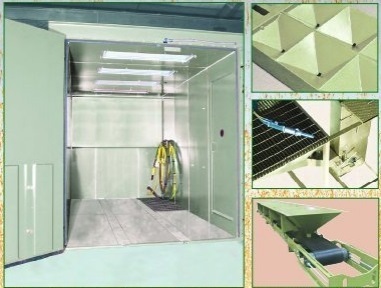 As the name says, these blast rooms arrive at your site ready to install. Connect the components and add power and air. Because the room must ship via truck, room dimensions are limited to 14 feet by 7 feet by 8 feet tall. The room includes full area recovery – pneumatic or mechanical – as well as lights, control panel, one full-width, full-height door, and a separate personnel door. You can select the blast machine package (one or more operators), dust collection (recovery only or full room), media reclamation system (air wash or cyclonic), blast suit and respirator, and any special parts-handling equipment you need. 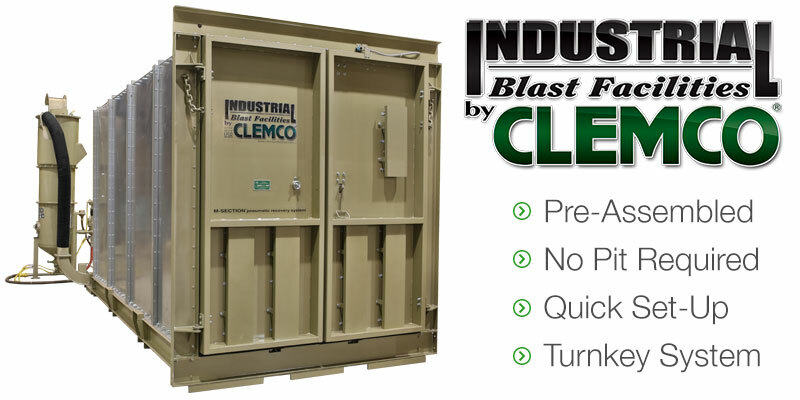 Clemco’s® sweep-in media recovery systems, with high-efficiency dust collection, offer an economical alternative to full-area recovery. Install a sweep-in system in your new or existing blast facility and switch to recyclable abrasives – the cost saving and increased productivity can pay for the system in a few months.